Today we continue with the party journals from Hoard of the Dragon Queen. The in-game dates are Marpenoth 1st and 2nd (by the Calendar of Harptos). The party infiltrates the cultists' camp, and learns what they can of their activities while trying to rescue Leosin Erlanthar. For more information on the characters or the campaign in general, check out the Tyranny of Dragons Index. The walk to the half moon canyon was easy enough, but I confess I was nervous. Sneaking in broad daylight and pretending to be a member of this idiotic cult is not my strength. I walked a few steps behind Sallos and Ennis. Nithbis was nowhere to be found at that moment. I wondered where she had gotten to or perhaps she was invisible. Druids control a wide variety of magic. The events of Episode I took place over two sessions. As I previously outlined, I mostly ran it as-is from the book, but shortened many of the unnecessary "Kobolds & Cultists" fights, and cut some missions for time. Episode II sees the heroes tracking the cultists to their camp and rescuing Leosin Erlanthar. The episode works okay, but you need to really read between the lines to make sure the right info comes across. Merric's Musings has an excellent article on the goals and key points that need to be hit. Today, the heroes continue their quest after the events of Greenest. The party tracks the cultists across the Green Fields, on their way to find the cultists' camp. Read the previous entries by checking out the index page here: . For the first time in many days I'm in my element. Tracking prey across woods and plains. They were so many that it isn't difficult. I count over a hundred. Men and kobold and one barefoot traveler. I stay a few yards ahead of our party. I come back to relay information. I try to bring Ennis with me while scouting. I want her to know how to track and I would like some time to just speak with her. I make a few attempts to talk. I'm not even being quiet with my steps as it takes all of my concentration to find the words. She half smiles and I feel it must be an invitation to keep talking but she doesn't respond and walks on ahead. Ahead I see a campfire. Small but noticeable in the distance. After the second HOTDQ session, all 4 players wrote journals! (Nathan sadly bowed out of the campaign for a few weeks, so Yenorin was NPCd) If you haven't already, check out the first journal! Obviously, there are spoilers ahead. Make sure to check out the Tyranny of Dragons Index for more!. This post will include spoilers for Hoard of the Dragon Queen! It will also assume some familiarity with the adventure. 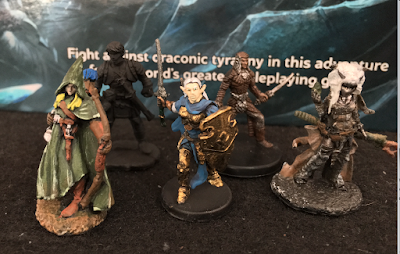 After more than a decade away, I had a group ready to play D&D! I had heard great things about fifth edition, and after picking up the books I was not disappointed. Until now I had never ever ran a pre-generated adventure, but the idea was appealing these days (oh, if only we could get another day in the week!). This is the first in a long series of In Character journals written by the players (mostly my friend Sean who is quite prolific!) detailing their adventures as I DM Hoard of the Dragon Queen. 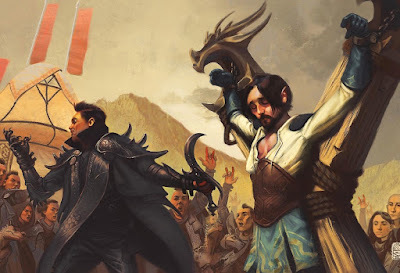 Sallos Zha Zhoala the Human Rogue played by JeffEnnis Naïlo the High Elf Cleric played by LydiaNithbis the Tiefling Druid played by RavenYenorin the Half-Elf Fighter played by NathanDanaeron the Wood Elf Ranger played by Sean Journals after the cut! This is a D&D blog. On it I plan to post in character journals from various ongoing campaigns, "behind the screen" DM thoughts, and whatever else floats the boat. Word.